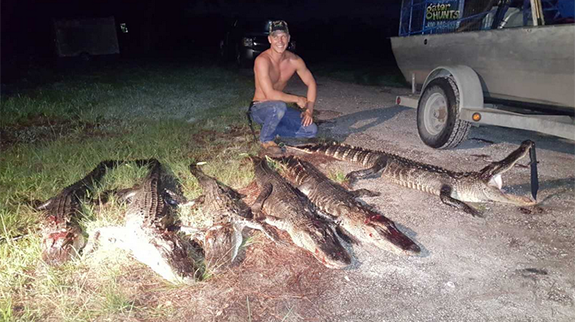 We have conducted more guided gator hunting in Orlando, FL, than any other guide service in the State of Florida. We have been wrangling gators since 1990 and still have all of our fingers and toes. We are third generation gator hunters; and now, we have started transitioning into the fourth generation of hunters pursuing these apex predators. 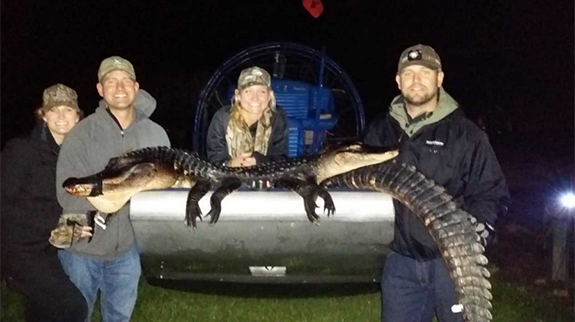 We have had the pleasure of taking over 1,000 clients, with hunters coming from over a dozen different countries, on an unforgettable gator hunt. Each year we see more and more repeat clients, due to their previous successful hunting adventure and our attention to the small details. We are endorsed by more professional hunters than any other alligator guide, and most of them have hunted with us on several occasions. We have been featured on more than 25 shows on "T.N.N. OUTDOORS," as well as "E.S.P.N.2" and the OUTDOOR CHANNEL. Additionally, we have been featured in many books and magazine articles, including one written by esteemed hunter Jim Shockey. 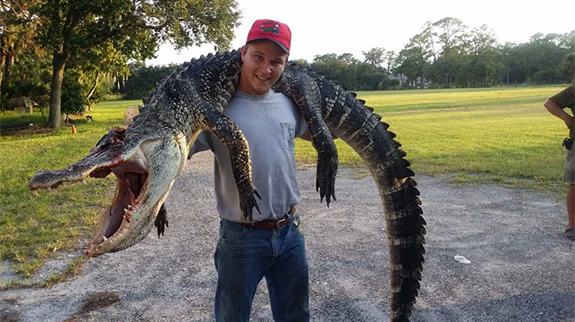 The article outlined our hunt for a giant, 12-foot long trophy gator. Ultimately, the trophy we captured ended up being ranked #1 with a muzzleloader in S.C.I. 's record book. For three consecutive years, we were the sole driving force working with the Record Book Committee of Safari Club International. We meet with them annually at our expense in order to provide the information they needed about the American Alligator. Our diligence paid off when S.C.I. made the decision to place alligators over nine feet in length into the record books. We have maintained an outstanding working relationship with S.C.I. for over twenty-five years. In fact, we have donated countless Florida alligator hunts to the National Convention and the local chapters throughout our time with them, and our contributions have exceeded $100,000. With your support, we hope to be able to continue our donations to a wonderful organization. We were truly honored when we were asked by the Florida Game Commission to assist them in a promotional hunt. We were chosen above all the other guides due to our successful gator trapping and hunts. Our priority is safety, as well as our outstanding reputation in the hunting industry. 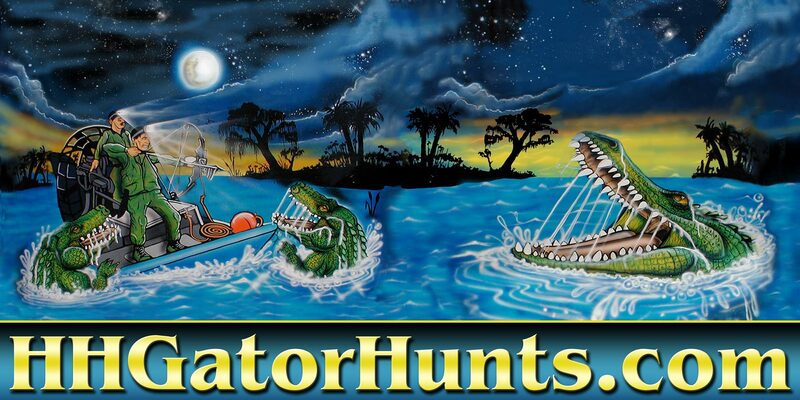 Their hunt was designed to help promote Florida and the alligator hunting industry. In addition, we have worked closely with the Commission to create alligator programs that educate national and international hunters about the American Alligator. Also, we happily serve as the only business that provides a safety class for law enforcement divers dealing with alligators, and we have provided training seminars to officers on the laws and regulations governing gator hunting programs. We have worked with the "Foundation for Hope" organization and successfully guided their hunters to several trophies. The foundation provides funding for physically challenged hunters to participate in alligator hunts around the country. We had participated in charitable organizations such as this since early 2000, when we donated a Florida alligator hunt to the "Hunts of a Life Time" program. 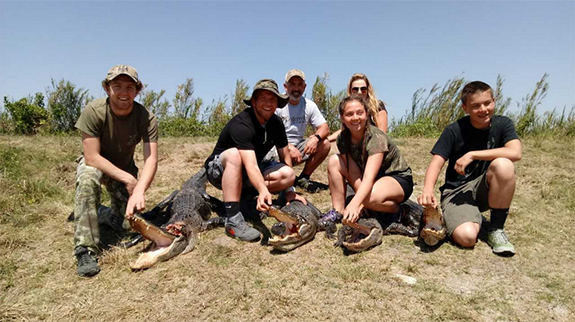 Each session has been a very rewarding experience for our business, and we are proud of the fact we are the only alligator hunting guides that these reputable organizations entrust their young hunters to.